What is a Unicellular Organism? Essentially, unicellular organisms are living organisms that exist as single cells. Examples include such bacteria as Salmonella and protozoa like Entamoeba coli. Being single celled organisms, various types possess different structures and characteristics that allow them to survive. 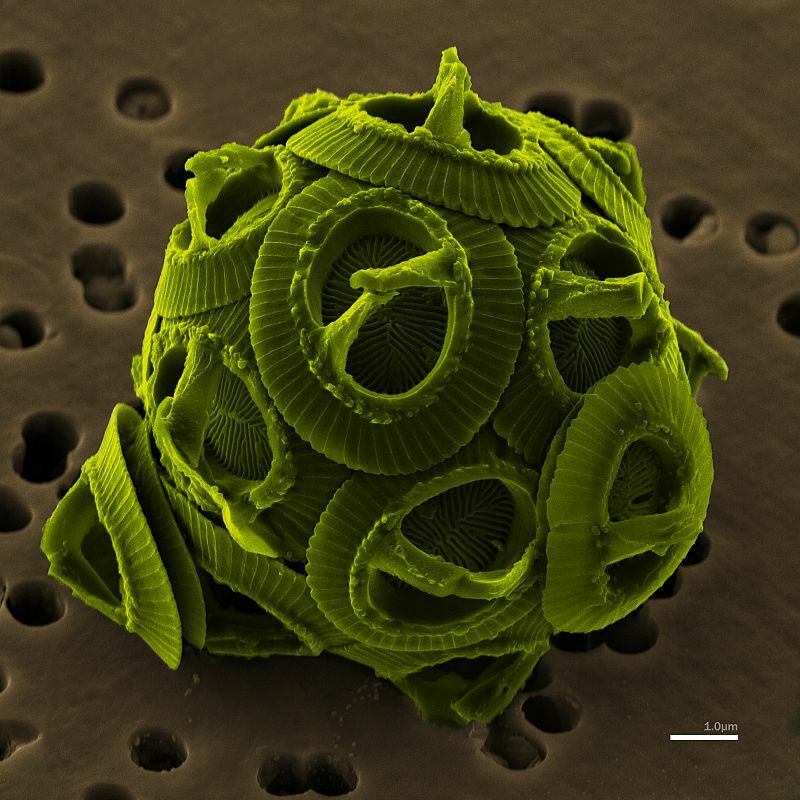 According to a report that was released in 2012 from the University of Potsdam in German, it was stated that the ocean is home to an estimated 2.9×1029 unicellular organisms (about 20,000 species). Here, it is worth noting that this figure only represents the number of single-celled organisms in the ocean and not on land. Which in other words means that the total number is much higher. Despite their diversity, they share a number of basic characteristics. Organization - Unicellular organisms possess various structures that make it possible for them to survive. These structures are contained within the cell (in the cytoplasm) and include such structures as the endoplasmic reticulum and genetic material among others. Growth - Given that they are living things, unicellular organisms increase in size. Reproduction - Unicellular organisms also reproduce, which allows them to form other organisms that are like themselves. The genetic material possessed by these microorganisms divides allowing each of the daughter cells to get an exact copy of the genetic material that was contained in the original cell. Response to external environment - Unicellular organisms also respond to various conditions such as change in temperature, light as well as touch. It is this ability to respond to environmental changes that make it possible for unicellular organisms to find food and continue surviving. * Considering that single-celled (unicellular) organisms have the characteristics of living things, we cannot include viruses here. This is due to the fact that viruses are not considered living things despite the fact that they have genetic material and various characteristics of living organisms. Viruses don't take in energy like other unicellular organisms. They depend on the host cell to reproduce (they are unable to reproduce on their own). See more on viruses under the microscope. Bacteria (single - bacterium) are some of the most abundant unicellular organisms in the world. For instance, according to the National Academy of Sciences, a single human body is estimated to have 100 trillion individual bacterial cells. They are prokaryotic cells, which means that they are simple, unicellular organisms that lack a nucleus and membrane-bound organelles (they have small ribosome). For a majority of bacteria (prokaryotic cells) the DNA is contained in a nucleoid in form of a large loop of circular chromosome. Different types of bacteria will have such structures as the flagellum, pili, a biofilm, cell wall and a capsule among others. Although a good number of bacteria can and do cause both human and animal diseases, some bacteria are very important. For instance, whereas bacteria like actinomycetes are used to produce antibiotics that are valuable in treating given diseases, others like Lactobacillus bulgaricus and Streptococcus thermophilus are used in yogurts. Other types of bacteria have also been shown to be beneficial in such industries as agriculture and the food industry. There are different types of bacteria based on shape, nutrition, gaseous requirement as well as the cell wall. The cocci bacteria are spherical in shape (or ovoid). While they may occur as single cells, the cocci bacteria can also remain attached to others. Streptococci bacteria - Streptococci bacteria occur as chains with a number of bacteria being attached to each other in a chain like manner. A good example of streptococci bacteria includes the species Streptococcus canis and Streptococcus bovis. 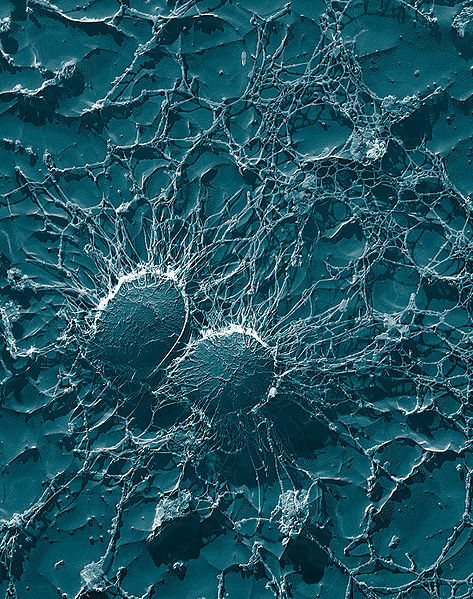 Staphylococci bacteria - This type of bacteria occurs in a cluster. An example of staphylococci bacteria is Staphylococcus aureus. Some of the bacteria that exist in clusters only exist in clusters of four and are known as tetrads (such as the species Micrococcus). Spirilli are Gram-negative bacteria that tend to be spiral in shape. They belong to the family Spirillaceae and include the species Spirillum winogradskyi and Spirillum volutans. While the spirilli are spiral in shape, vibrio bacteria such as Vibrio cholerae are comma shaped. Autotrophic bacteria are the type of bacteria that can synthesize their food from inorganic substances (substances that do not contain carbon). For this type of bacteria, carbon dioxide is used to obtain carbon. There are two main types of autotrophic bacteria. Photoautotrophs - Photoautotrophic bacteria are the type of bacteria that have a photosynthetic pigment (purple pigment, green pigment etc). These pigments are used to synthesize food (carbohydrate) in the presence of sunlight through a process known as photosynthesis. Chemosynthetic bacteria - Unlike photoautotrophic bacteria, chemosynthetic bacteria can synthesize food from given inorganic chemicals in the absence of sunlight. As such, they do not require light energy to synthesize food. Ferrromonas bacteria or iron bacteria like Leptothrix. These bacteria obtain energy from the oxidation of ferrous compounds. Heterotrophic bacteria are the type of bacteria that obtain energy from organic compounds. This means that they are unable to make their own food, and thus use ready-made foods as their source of energy. Saprophytic bacteria - This includes bacteria like Acetobacter that obtain energy from dead and decaying organic substances like leaves, meat and humus. These bacteria are able to secrete enzymes that are used for fermentation or putrefaction during digestion. Parasitic bacteria - Bacillus anthracis and Vibrio cholerae are examples of parasitic bacteria. As such, they obtain energy from the tissues of living things. Whereas some may be harmless, some of these bacteria can cause serious diseases to the host. Symbiotic bacteria - Symbiotic bacteria like Bacillus azotobacter and Rhizobium are able to establish a symbiotic relationship with the host. As such, they are beneficial to the host and do not cause harm. Bacteria are also classified according to gaseous requirements. Whereas some bacteria need oxygen to survive, others do not. Aerobes - Aerobes (aerobic bacteria) are the type of bacteria that can only live and reproduce in the presence of oxygen. There are two groups of aerobes which include the obligate aerobes and the microaerophiles. For obligate microbes like Mycobacteria, high concentration of oxygen (like in room air) is required for life. However, microaerophiles like Campylobacter only require a lower concentration of oxygen (about 5 percent of oxygen) to survive. Anaerobes - Unlike aerobes, anaerobes are the type of bacteria that do not need oxygen for survival. Anaerobes include obligate anaerobes like Clostridium that are unable to live and reproduce in the presence of oxygen and facultative anaerobes like Staphylococci bacteria that can survive in the presence or absence of oxygen. Gram-stain technique is also used to classify bacteria. Whereas the cell wall of certain bacteria contains a thin layer of a polymer known as peptidoglycan (Gram-negative bacteria) in between the inner and outer lipid membrane, others have a thicker layer of the polymer n addition to lipoteichoic acid (Gram-positive bacteria). Because of the think polymer in their cell wall, the Gram-positive retain the crystal violet dye of Gram stain and appear purple under the microscope. However, Gram-negative bacteria have a thinner layer and are therefore unable to retain the color. As a result, they stain pink/red by taking Safranin stain. Unlike bacteria, protozoa are eukaryotic unicellular organisms. A majority of protozoa are free living (they can exist on their own) while others infect higher animals and can cause diseases. Being eukaryotic cells, protozoa portray traits that are common among other animal cells. This is due to the fact that they possess a nucleus and a number of other important organelles within the cell membrane. Given that there are different types of protozoa, classification is largely based on means of locomotion. 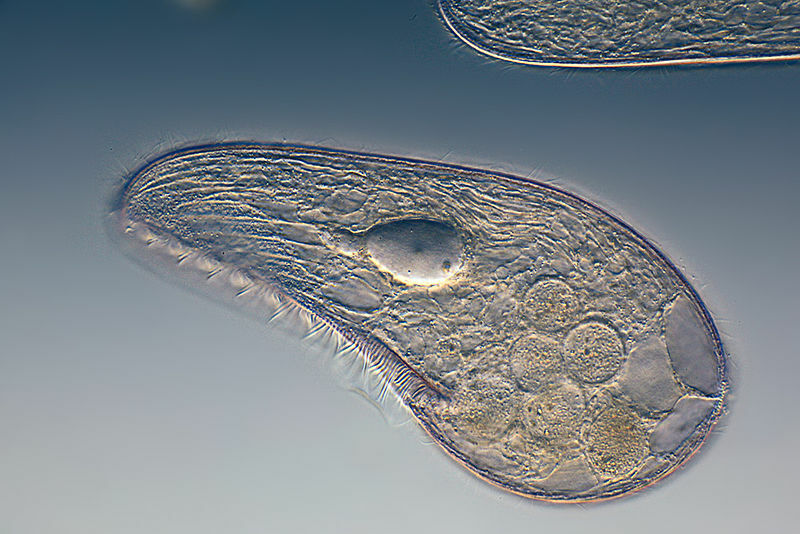 The phylum Sarcodina is the largest phylum of protozoa and contains an estimated 11,500 species of protozoa. Amoeba proteus and Entamoeba histolytica that belong to this phylum move through the streaming of the ectoplasm. In addition, unicellular organisms that belong to phylum Sarcodina also use temporary pseudopodia, which are projections of the protoplasm commonly, referred to as false feet. Mastigophora is also a phylum of protozoa and includes the likes of Giardia lamblia and Trichomonas vaginalis. While some have temporary pseudopodia, a majority of Mastigophora are flagellates, which means that they are propelled by a whip-like structure during motion. These flagellates may have a one or more flagella that make movement possible. Some in the phylum Mastigophora are free- living organisms (Cercomonas longicauda etc) while others exist as parasites (e.g Trypanosoma gambiense). Unlike the Phylum Mastigophora, unicellular organisms in the Phylum Ciliophora possess cilia, which are short hair-like projections that propel them and ensure their movement. Some of the more common examples include Paramecium caudatum and Vorticella campanula, which are free living. Known as ciliates, these unicellular organisms may also have these projections around the mouth for feeding. The parasitic form of Ciliophora includes Balantidium coli. Essentially, Sporozoa are parasitic forms that lack locomotor structures. Common examples of Sporozoa include the Plasmodium species that cause malaria in human hosts. According to the Center for Disease Control and Prevention, Earth is home to an estimated 1.5 million species of fungi. Of these, over 800 species of the single-celled fungi (yeast) have been identified. Like protozoa, yeast are also eukaryotic cells, which means that they possess a cell nucleus and other cell organelles. This is the budding yeast that is known to convert carbohydrates to carbon dioxide and alcohols. This specie of yeast is particularly used in the food industry and particularly for making bread. The carbon-dioxide produced during the breakdown of carbohydrates makes the dough rise. Given that it also produces alcohol in the process, the yeast is also used in the alcohol industry. While some yeast are beneficial and are used in such industries as the food industry, others are pathogenic and tend to cause diseases. These are mostly opportunistic pathogens, which means that they cause infections among people with poor immune systems. 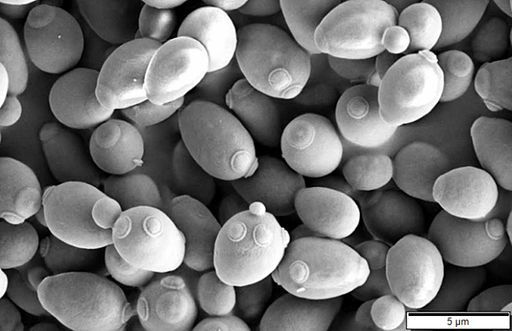 An example of pathogenic yeast includes Cryptococcus neoformans which has been shown to cause systemic infections. Algae includes a diverse group of photosynthetic organisms that can be found in a wide range of habitats (aquatic to land). The unicellular algae are mostly plant-like autotrophs that can make their own food. Chlorophyta (Green Algae) - Chlorophyta are green in color because of the presence of chlorophyll. They may also contain a carotenoid pigments and includes the likes of Chlamydomonas, which use flagellum for movement. Charophyta - The division Charophyta includes some members of class Zygnemophyceae such as Zygnematales. Motile cells in this division also possess flagella and are mostly biflagelated. Euglenophyta - A good example of this division is the Euglena cell. These cells possess a large nucleus as well as a nucleolus. They also have chlorophyll and the caroteid pigments that make photosynthesis possible. These cells also use flagella for movement. Chrysophyta - Diatoms are some of the most common Chrysophyta. They are enclosed in a cell wall that is made up of silica and may exist as single cells or in colonies. Pyrrophyta - Some of the most common Pyrrophyta includes dinoflagellates like marine planktons. They also include amoeboid cells and possess chlorophyll and such pigments as the carotenoid and xanthophyll pigments. Like bacteria, Archaea are prokaryotes, which means that they lack a well defined nucleus and membrane-bound organelles. Although they are prokaryotes like bacteria, the Archaea are distinct with regards to their biochemistry, which distinguishes them from both bacteria and other unicellular eukaryotes. For instance, unlike bacteria, the cell wall of Archaea lack peptidoglycan. In addition, the lipids of Archaea lack fatty acids (fatty acids are replaced by isoprene units), which can be found in both bacteria and eukaryotes. Although the identification and classification of Archaea has been shown to be rather difficult, they can be grouped in the following phyla. Crenarchaeota - The phyla Crenarchaeota is largely composed of hyperthermophiles and thermoacidophiles both of which may be described as extremophiles. Extremophiles can be found in marine environments as well as other extreme environments such as hot and acidic springs. A good example of extremophiles is the Sulfolobus acidocaldarius that can be found in terrestrial solfataric springs. Euryarchaeota - this phylum is largely composed of halophiles (e.g Halobacterium) and methanogens (e.g Methanococcus). The halophiles are mostly found in such salty environments as the Dead Sea while methanogens can be found in animal intestines (cows and human beings) as well as in wetlands. Korachaeota - Unlike Crenarchaeota and Euryarchaeota, the phylum Korachaeota has been shown to consist of more primitive members that are thermophilic in nature. They are also only found in hydrothermal environments and include the Species Candidatus. Here, learn more about Cell Culture, Cell Division, Cell Differentiation and Cell Staining as well as Gram Stain. And check out information on Cell Theory. Kallmeyer, J., Pockalny, R., Adhikari, R., Smith, D. & D'Hondt, S. Proc. Natl Acad. Sci. USA http://dx.doi.org/10.1073/pnas.1203849109 (2012). Kenneth J. Loceya and Jay T. Lennona (2015) Scaling laws predict global microbial diversity. Protozoa: Structure, Classification, Growth, and Development. Robert G Yaeger 1996.The Columbia Electronic Encyclopedia, 6th ed. Copyright © 2012, Columbia University Press. All rights reserved.